The A82 north of Drumnadrochit. 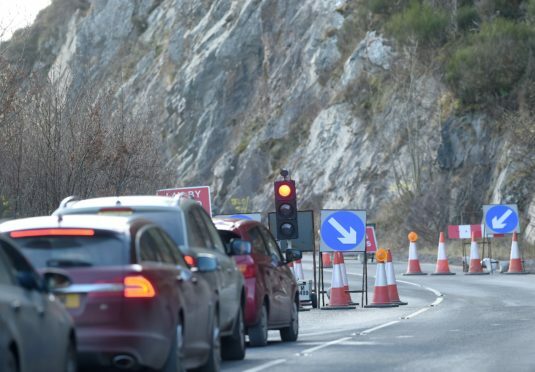 Motorists travelling on one of the busiest roads in the Highlands face 10 weeks of delays as improvement works are carried out on the popular tourist route. Two sections of the A82 will be affected by closures, one lasting until March – causing chaos for regular commuters and other motorists. The biggest disruption will be at Wellington layby, between Inverness and Drumnadrochit, as £500,000 of rock stabilisation works are carried out – starting on Monday. Around 1,150 tonnes of rock will be removed from two sections of the rock face to make way for the installation of specialist netting and bolts to secure and stabilise the slope. The works are to be carried out between 8am and 5pm – with a 10mph convoy during office hours and traffic lights at night. Contractors will be on site seven days a week in an effort “to minimise disruption”. In February 2017, similar work was carried out on the same stretch of the A82. Highlands and Islands regional MSP and road safety campaigner David Stewart said: “It is important that our roads infrastructure is as safe as possible and that means at times there will need to be remedial work to carry out works, in this case rock stabilisation. A 10mph convoy system will be put in place each day, and will be replaced with a temporary traffic lights system outwith working hours. Eddie Ross, BEAR Scotland’s Representative for the North West, said: “This latest investment to the A82 will help increase road safety by removing around 1,150 tonnes of rock from the slope above the roadside and then securing it with wire netting to prevent any further debris reaching the carriageway. Meanwhile, 25 miles south, mechanical maintenance works is currently on-going at the Fort Augustus swing bridge to ensure the crossing remains in operation across the Caledonian Canal for generations. 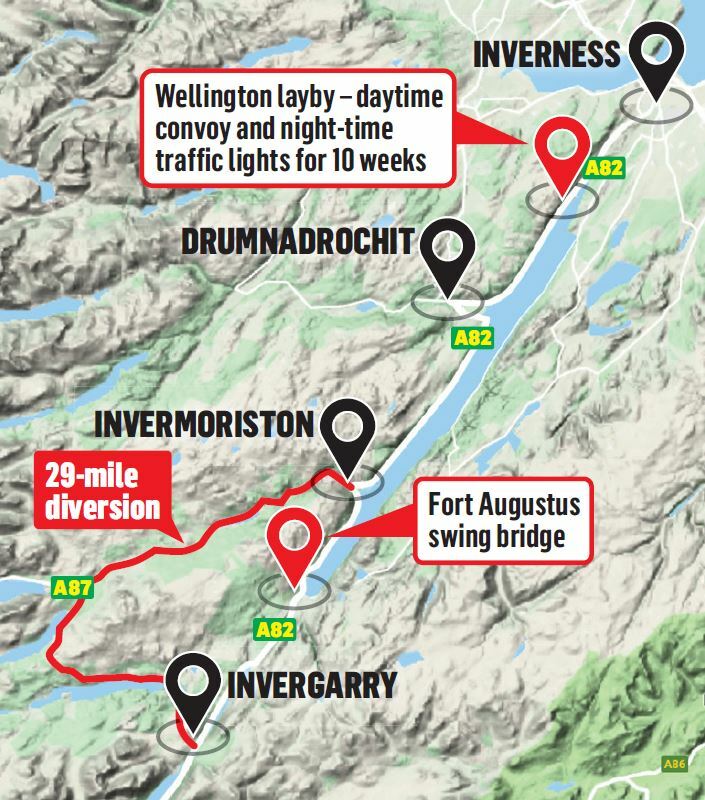 Motorists travelling on the A82 between 7pm and 6am weekdays are being faced with a 29 mile diversion along the A87 and A887 as the popular route remains closed. The works, worth £500,000, are expected to remain in place until next Friday with no works taking place over the weekend. Part of the A9 is to shut a two-year programme of work which begins on Monday. A six-mile stretch from Luncarty, north of Perth, to the Pass of Birnam is being dualled. The north diversion is a total of 51.5 miles while the south diversion is 28 miles long. Restrictions include narrow running lanes and a speed limit of 40mph through the works area which will remain in place until completion of the project in Spring 2021. The stretch between Luncarty and Dunkeld will fully close from 8.30pm to 6am for four nights, from Friday February 22 to Monday February 25. Barriers will allow construction adjacent to the A9, whilst maintaining one lane of traffic in each direction. When this stretch of road is complete road users will benefit from 9.3 miles of continuous dualled carriageway from Inveralmond roundabout in Perth to Pass of Birnam.